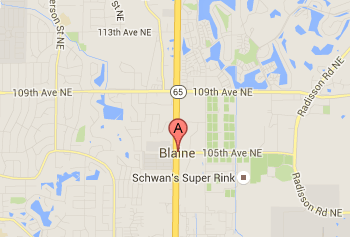 We Will Travel to Blaine to Replace or Repair Your Windshield. If you live in or near Blaine, MN and are in need of a windshield replacement or other auto glass repair service, Auto Glass Express can help. We can even fix your windshield at the Super Rink while you catch a hockey game. Our mobile windshield service allows us to fix your auto glass at any location that is convenient for you. Need a Windshield Repair or Replacement? We've been in the auto glass repair and replacement business for over 20 years and we work on all vehicle makes and models. We're approved by all major insurance carriers, too. If you're making an insurance claim, our staff can help you through the process. To schedule a service, call us at 651-494-9252, or make an appointment online. At Auto Glass Express, we're dedicated to doing quality work and customer satisfaction. We're rated as an A+ business by the Better Business Bureau and we're also AGRSS certified. We adhere to very strict installation standards and all glass repairs undergo a rigorous 11-point checklist after installation.